Year 3 went on their very first residential trip to St. Stephen's Khao Yai Campus on Thursday 25th and Friday 26th of May. All of the children had a fantastic time taking part in lots of different activities. 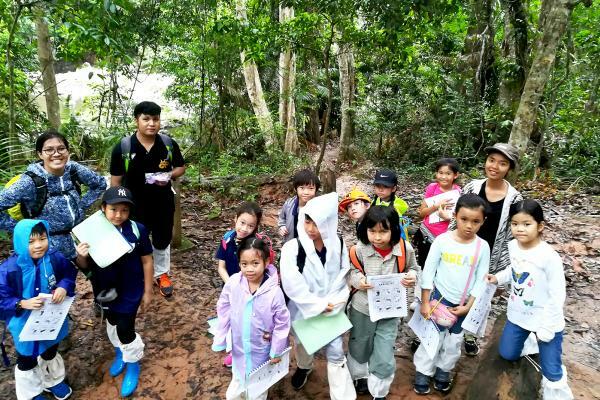 They explored the Khao Yai National Park Visitor Centre and went for a nature walk on Thursday, despite the rain, where they saw different plants and animals and lots and lots of leeches. Everybody stayed safe by wearing leech socks and looking after each other. Due to the rain, there was not the planned outdoor barbecue and camp fire but everyone still got to eat yummy barbecue food and then watched a movie before everybody went to bed for a great night's sleep. The next morning the children got up and had breakfast before doing lots of fun team activities in the gym. After that, everyone got on the bus and went to Farm Chok Chai; the children made ice-cream, went to the shop and had delicious burgers for lunch before getting on the bus to come back to school. All the children had a great time, with many of them saying they didn't want to come home and wanted to turn around and go back to Khao Yai instead. Well done to all the children for being excellent on their first ever residential trip.